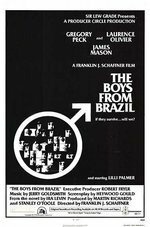 I recently caught a TV screening of The Boys from Brazil, a film adaptation of Ira Levin’s novel, concerning the nefarious actions of Dr. Josef Mengele in South America, and his pursuit by a Nazi-hunter presumably modelled on Simon Wiesenthal. Certainly a rather motley cast, with Laurence Olivier showing why he is so often cited as amongst the highest echelons of English-speaking acting, whilst James Mason poorly attempts to cover up his stiff accent. Still not entirely sure what to make of Peck’s performance. Regardless, the film is entertaining, even if you’ve heard the twist previously as I had. Produced slightly before Mengele’s actual death in Brazil in 1979, it reminded me of a German film I’d read about entitled Nichts als die Wahrheit, which portrays the fictitious events of Dr. Mengele’s trial as he returns to German, a sick, old man. Sadly, I was unable to track the film down on the Internet, and at least according to this website the film is currently only available on VHS. Hopefully that situation will be rectified before too long, but if anyone knows where or when it might be published on DVD, please leave a comment. Previous Post Will Anyone say ‘No’ to the ‘No Smoking’ Ban? Und schon wieder von Jochen. Dieses Mal geht es um die Sesamstrasse. Wie ich diese Serie liebe…Welchen Charakter aus der Sesamstraße fandest Du am coolsten? Ganz am Anfang fand ich Tiffy toll. Ich war lieb, Tiffy auch. Also passte das.